YOU'VE GOT QUESTIONS ABOUT TREKKING TO EVEREST BASE CAMP? Tell me more about your local trekking partners Take on Nepal. EVEREST base camp?! Can I do this? Where do we stay and what’s the food like along the EBC Trek? What is the best time of year to trek to EBC? Do you have any insider tips or tricks you think I should know? How do I sign up for one of your Everest Base Camp Treks? When do your EBC Adventures start to fill up, and by should I book? I'm a solo traveler, will there be other solo travelers like me? Do I need to get vaccinations or visit a doctor? How should I train for the Everest Base Camp Trek? Is it true I’ll have access to the internet during the trek? What are some cultural traditions I should be aware of in Nepal? What do I do with my extra luggage while I am hiking? What happens if our flight in or out of Lukla is cancelled or delayed? Lukla has been described as the Most Dangerous Airport in the World. Why? Is this really the case? How should I pack for the trek? What if I don't have all the gear? Do you offer gear rental? What happens if I become sick or injured during the trek? I heard you can buy things along the trail. How much cash do you recommend I bring along on the trek? DON'T SEE WHAT YOU'RE LOOKING FOR? PLEASE REACH OUT TO US AT ADVENTURE@WHOATRAVEL.COM WITH YOUR Qs AND WE'LL GET BACK TO YOU ASAP. Tell me more about your local trekking partners Take on Nepal. How will we be supporting and connecting with local women and communities on this adventure? 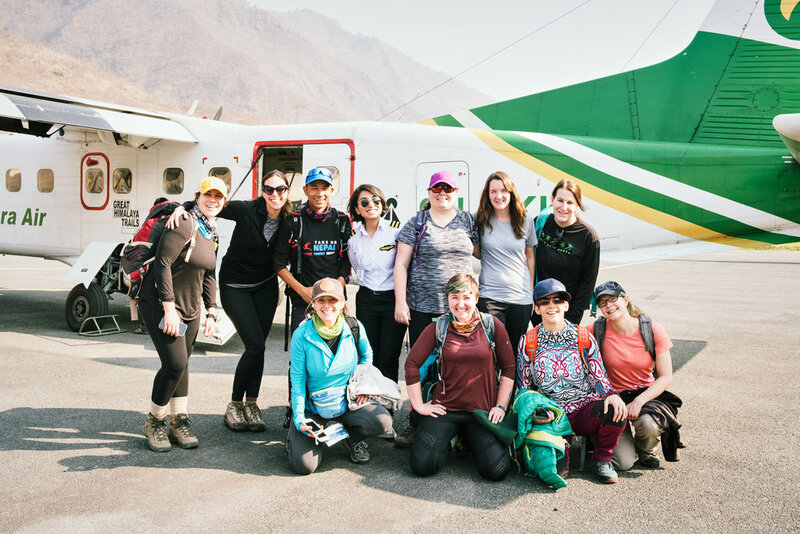 TAKE ON NEPAL is a local organization, with deep roots in the Everest Region, that is all about empowering women and improving the future of Nepal. They have dedicated themselves to bringing more opportunities to women of the mountain villages of Nepal, where many young girls have little or no education, and marriage at an early age is still common. Take on Nepal’s core team of porters and guides is made up of young women from Batase village outside of Kathmandu. Take on Nepal educates and trains these young women to be mountain guides, giving them the same opportunities that their brothers have, opening their eyes to the possibilities of a larger world, and giving them a future as educated, independent women.Our crew is filled with passion and provide invaluable insight into the culture of this majestic part of the world. Trekking with them for 12 days will give you a deeper understanding and connection to Nepal, while also providing employment to people who rely on tourism to survive. We go above and beyond to ensure our entire crew is treated with respect, and we adhere to strict standards for our staff. 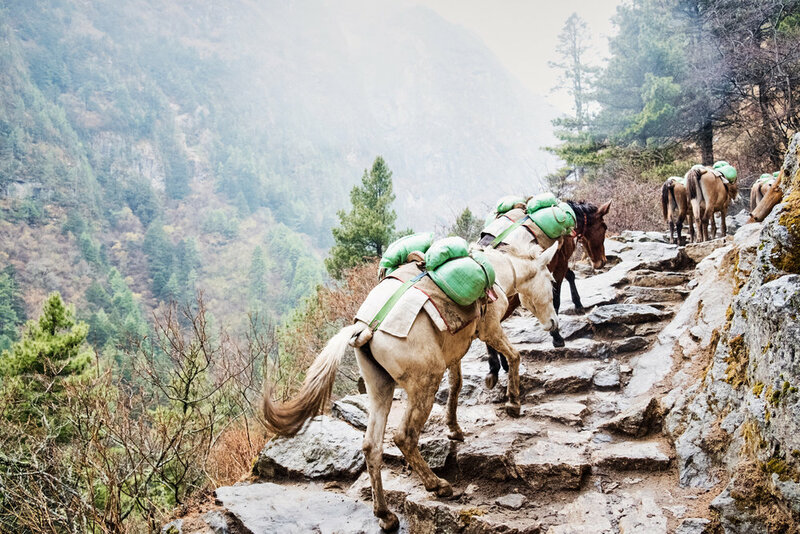 Examples of these standards include fair wages, evenly divided tips amongst our entire crew, less than average weight that porters carry, proper meals, and proper outfitting. Our guides and porters are an integral part of our team, they are like family, and we believe their success is our success and vice versa! Yes! If you’re physically fit, have a positive attitude, and love the great outdoors we believe you can do this. 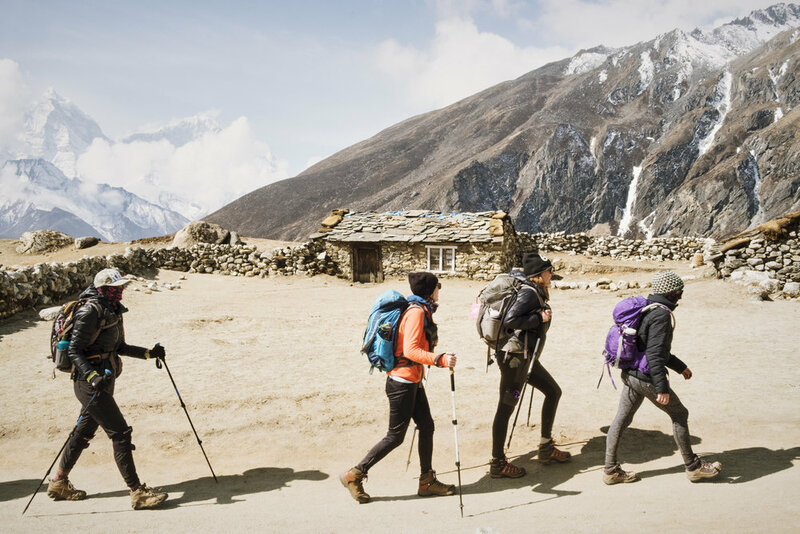 Hiking in the Himalayas is the experience of a lifetime, and we know first hand it's one that will leave you with a changed perspective of yourself and the world around you! That said, nothing worth having comes easy, so before taking on the EBC trek we highly recommend that you train and have experience with multi-day, high altitude trekking. All in all, with dedication, and the support of our crew, you can achieve this goal! Where do we stay along and what’s the food like along the Everest Base Camp Trek? Accommodation is in cozy tea house lodges along the trekking route. The rooms are small and basic with two single beds for you and another adventurer from our group (during peak trekking seasons there may be more than two WHOA ladies to a room). You’re provided with a pillow, but you’ll need to have a warm sleeping bag to stay comfortable and warm at night! At the lodges, most of your time, other than sleeping, will be spent in the dining room. These Tibetan-style timber rooms are an oasis after a day of trekking! They are warm, homey and filled with other happy adventurers and the smell of Dal Bhat! Generally, the best time to trek in Nepal is February - May, when spring is blooming and the temperature has warmed after winter, and September - December when the clouds start lifting after the summer monsoon rains, leaving you with spectacular views! We plan all our adventures in these time frames for that very reason. That said, mother nature is unpredictable and you have to always be prepared for unseasonably rainy, cloudy, cold or warm weather at any time of year. Either way, that’s part of the adventure, and whatever the weather, hiking among the Himalayas is an exhilarating experience! We sure do! We’ve learned quite a few valuable lessons from our treks. We strongly recommend you check out THIS ARTICLE by our GAL Briana for the TOP TIPS, TRICKS & THINGS YOUR SHOULD KNOW BEFORE YOU GO TO EBC! How do I sign up for a WHOA Everest Base Camp Trek? Reserving your spot is easy! Just visit our UPCOMING EBC ADVENTURES, choose the trek with your preferred dates, and put down a $500 deposit. After you've paid your deposit, our team will send you an invoice that will allow you to make payments on your adventure. The due date for final payment is about 3 months before the adventure start date. WHEN DO YOUR EBC ADVENTURES START TO FILL UP AND WHEN DO YOU RECOMMEND BOOKING? There is no way to know exactly when a trip will fill up, but it's worth noting our adventures usually sell out with extensive waitlists, and the Everest trekking season is limited, so the sooner you can book, the better. That said, we have several dates to choose from (check out our UPCOMING EBC ADVENTURES for all of them), so there's a great chance one of our adventures will work for you! Meals, accommodation, permits, the flight in and out of Lukla*, tips and salaries for your amazing crew, and lots of WHOA TLC are all in included in the cost of this adventure. CLICK HERE for a complete list of what all is included in our price. *Due to inclement Himalayan weather and unforeseen circumstances, flights can be cancelled, and it would be the responsibility of the client to pay for alternate transportation options to Lukla. I'M A SOLO TRAVELER. DO PEOPLE USUALLY KNOW EACH OTHER OR ARE THERE OTHER SOLO TRAVELERS LIKE ME? There is a healthy mix of solo travelers and ladies who come with a friend, but the greatest thing about a WHOA adventure is that we walk in as strangers and leave as family. If you're traveling solo, we'll pair you up with another solo traveler to bunk with for the duration of the trek. You'll be amazed at how quickly bonds are formed between our mountain family! We require all our adventurers to have a Global Rescue plan to travel with us. Medical and security emergencies happen. When they do, we rely on Global Rescue to provide integrated medical, security, travel risk and crisis response services to our travelers worldwide. Without a Global Rescue membership, an emergency evacuation could cost you more than $100,000. There are 7, 14, and 30 day member plans to choose from, as well as an annual membership option (ideal for travelers who are going on more than one adventure per year). Please purchase a plan that covers your entire trip duration from departure through your return. Along with the mandatory Global Rescue membership, we STRONGLY recommend you travel with a travel insurance plan to protect you in case of trip interruption, cancellation, lost/delayed luggage, medical expenses, and much more. You can add-on supplemental trip insurance (policies provided through IMG) when you purchase your Global Rescue plan, or there are several other providers that could meet your needs. Do I need to get vaccinations or visit a doctor before taking on this adventure? Nepal does not require any vaccinations in order to enter the country, however, we recommend checking the CDC for the most up to date and current recommendations for vaccines. We do require that all adventurers visit a doctor to fill out our MEDICAL FORMS & RELEASE to asses their fitness to trek at altitude and to get more information on immunizations. Yes! Everyone will need a VISA to enter Nepal. They have a Visa On Arrival process, which makes it relatively easy to obtain on arrival. We will send more information on that once you are signed up for the adventure! The closest airport is the Tribhuvan International Airport in Kathmandu (TIA). Flights to Nepal from the United States are almost always overnight flights, so whatever day you plan to arrive you will want to leave a day earlier to ensure you arrive at your desired time. We recommend booking your air travel 3-5 months before your adventure start date to get the best deals. How should I train for this trek? The Everest Base Camp Trek is a significant physical and mental undertaking, so being in good shape will definitely enhance your experience! General aerobic fitness will allow the body to function more efficiently with less oxygen and withstand the stress of consecutive days of hiking and camping. Additionally, having strong, conditioned legs will help make it easier to walk up and downhill all day. One of the best things you can do to train is walk, after all, that’s what you will be doing in the mountains! Ideally, try to train a few days a week walking and/or jogging on inclines to simulate the ascension. (If you don’t have trails accessible, a treadmill or stair climber will do just fine.) Over the course of your training, it’s best to increase the time and distance while keeping a slow pace. In the end, if you can walk comfortably for 4 to 6 hours, with moderate elevation changes, while carrying some weight, then you’re probably in shape enough for the real deal. As with all training, for the last 2 weeks leading up to the big event, you should taper off and rest so your body has time to recover. While you’re training, don’t forget to break in your boots to prevent blisters! Also, try to wear the day pack you intend to carry so your shoulders/back/hips get used to the points of contact and weight. If you have the opportunity to hike at high altitudes, take advantage of it, so you can get used to the feeling of being active with less oxygen. Safety is of the utmost importance, so we also require all our EBC trekkers have a doctor fill out our MEDICAL FORMS & RELEASE and asses your overall fitness for an adventure of this kind. This adventure is 12 full days of hiking, so we can’t stress the importance of stamina enough - both physically and mentally! Having a positive attitude and a bigger reason for taking on this adventure will work wonders for you when you get tired and need that extra boost. We believe that a positive attitude, supportive team (like ours! ), and determination are crucial factors in achieving your goal to reach Everest Base Camp. 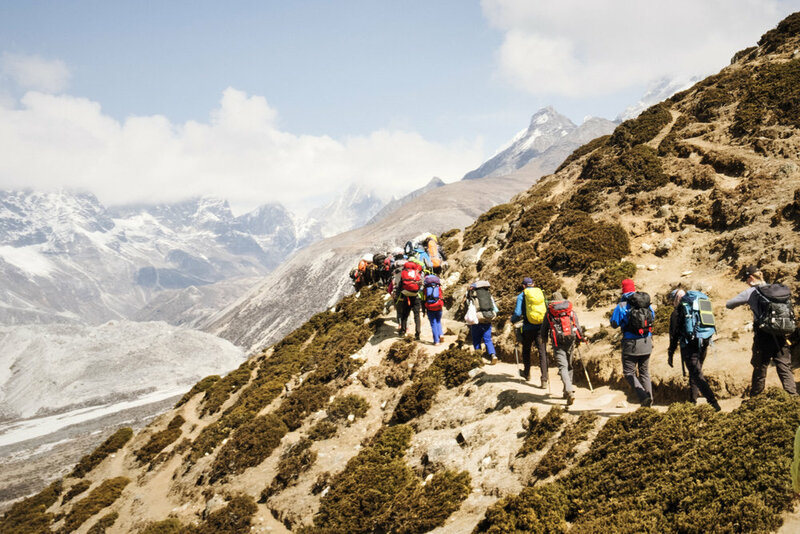 We’ve seen people of all ages and sizes successfully reach Everest Base Camp, and our trek is paced to allow plenty of time for everyone to reach our daily destination and adequately acclimatize. If you currently have an not-so-healthy lifestyle, use the trek as your motivation to change! Eat healthier. Drink less. Don’t smoke. Get more sleep. Don’t worry. Be happy! And remember, physical training is just one part of getting in shape. Staying positive will work wonders for you when you get tired and need that extra boost! We’ve put together a thorough, trail tested EBC GEAR AND PACKING GUIDE for all our adventurers. Follow it, but pack smart and use your discretion (no one knows what suits you best better than you)! Believe it or not, the most common mistake people make is having too much stuff. There is nothing worse than carting clothing and equipment with you for 2 weeks (at altitude) in Nepal and ultimately not having needed it. Keep in mind there is a strict weight limit of 10 kg for your duffel and 5 kg for your day pack (which is plenty for the trek, we promise)! We offer -20 C sleeping bag rental for approximately $4 a day. However, you should know, there are many gear shops that offer high quality gear at very good prices, and all of them are within walking distance of our hotel in Kathmandu. For example, it's often the same price to BUY a sleeping bag as it is to rent one for 2 weeks. It's common for our adventurers to buy poles, warm outer layer jackets, and sleeping bags in Kathmandu before the trek. When you arrive, you can ask our team and they will point you in the right direction of the best shops. Your safety is our number one priority. At altitude, sickness can set in at any time, but our treks are paced to allow your body to adequately adjust to the change in climate. Our team is skilled and experienced when responding to emergencies in the Himalayas, and will be monitoring your well being throughout the trek. 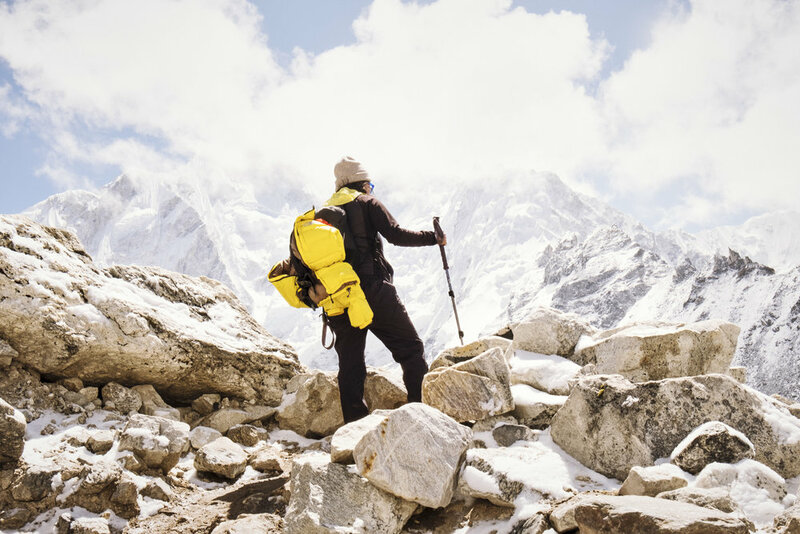 The most common and least dangerous form of altitude sickness is actually called “Acute Mountain Sickness” (AMS), and its symptoms include a light headache, nausea, loss of appetite, insomnia and fatigue. In most cases, it is treatable through rest and many people make it to their destination. However, if your condition worsens, helicopter evacuation is available to take you out of the region to receive medical treatment at a hospital. All our lead guides are trained and licensed in First Aid, mountaineering, and hiking and have a comprehensive risk management document that ensures most possibilities have been carefully addressed with plans put in place to make sure you are safe and well taken care of. Are tips for the crew included? Yes! Generous, fair tips are INCLUDED in the cost of the adventure, and we have a fun and celebratory tipping ceremony on the last day of the trek to thank our amazing crew! Yes, it’s true! There are small shops at all the tea houses where you can buy things on the route to Everest Base Camp. We recommend bringing around $20 USD per day in Rupees (small denominations) on the trek to spend on things like extra snacks, hot showers, Internet, a hot bottle of water, or dessert at these shops. As you can imagine, everything has to be helicoptered in or transported by yaks in to the Everest region, so be prepared that nothing is cheap. A can of Pringles can cost $10 USD, and a hot shower or bottle of hot water can be $5 USD (Heating up there is expensive!). Prices vary depending on what you buy and where the village is, but tourism is a huge part of the well being of the communities in this region, so look at buying locally, albeit at high prices, as a way to help support the local economy! Believe it or not, you can purchase somewhat reliable Internet access at most lodges and tea houses. But, remember, you’re in remote mountain villages, so it will go in and out often! The price and availability varies from location to location, and gets more expensive the higher up and more remote the tea houses are, but it usually runs around 600 rupees for 200MB. When trekking to Everest Base Camp, the most important thing to be aware of are the many Stupas, or Buddhist shrines. Your guides will point them out to you, and you must always walk clockwise around the Stupas. In Buddhism it’s considered important to go clockwise, as it relates to always moving forward in life, and not having regrets or going backwards (counter-clockwise). Also, Nepal is a developing country, and many people live in poverty, so it is considered polite to finish all the food on your plate. If you are simply too full to finish your meal, please offer the food to a friend or guide. Lastly, It is considered disrespectful to shout or use any profanity in the mountains of the Everest region. Always use a normal speaking voice and refrain from yelling out, or cursing unless you absolutely must! 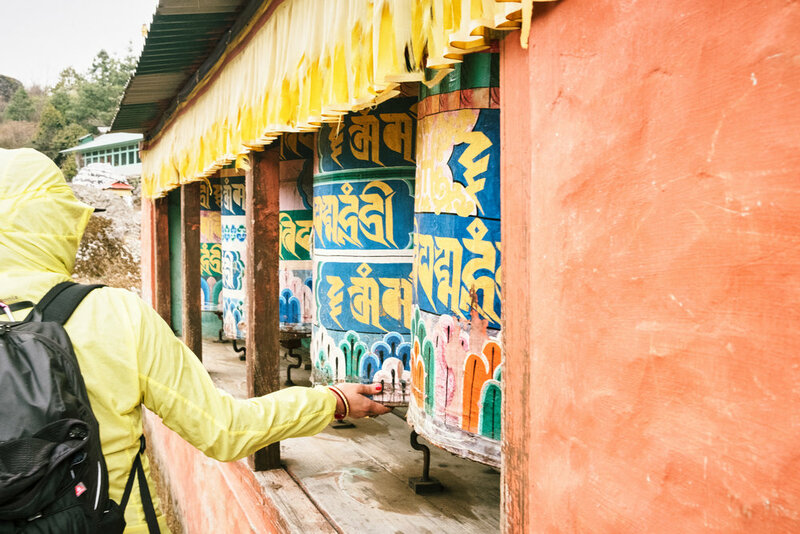 Our guides will teach you many other cultural traditions during your trek, and please feel free to ask your guide lots of questions along the way. Our guides love sharing their culture, and appreciate people showing an interest in their country! While you're trekking, your extra luggage will be stored safely in our partner hotel's luggage room in Kathmandu. We recommend bringing two luggage locks, one for the luggage left at the hotel and one for your duffel on the trek. Due to unpredictable weather conditions, flights in and out of Lulka are often cancelled or delayed, but it’s nothing to be concerned about. You may end up having to wait 1-2 days for another flight into Lukla, but days are built into our trek to accommodate for that. However, because of this, we recommend that you give yourself a buffer at the end of the trip, and schedule your flight out of Nepal a couple of days after the end of your trek. When flights are delayed or cancelled, another option is to privately charter a helicopter. It isn’t cheap, and can run around $2000 for 5 people, but it’s a guaranteed way to ensure you meet any deadlines you may have. Some travel insurances may cover this expense if it ensures you meet your scheduled ticket, just another reason we require it and why it’s so important to do your research on what is covered for your country and specific situation! NOTE: The additional time spent in Lukla or Kathmandu is not included in our price and will be a personal expense to our travelers, but we are more than happy to organize logistics, such as your accommodation, in Lukla or Kathmandu. Lukla has been described as the most dangerous airport in the world. Why? Is this really the case? The Lukla airport has this reputation because of the altitude, the surrounding mountains and the length of the runway. However, its short, steep runway is actually what allows the flights to land safely. When you do your research, you’ll find it’s actually just an exaggeration, and that over the past 40 years, there has been only one fatal plane crash here. During peak season, up to 30 flights safely take off and land in Lukla on a daily basis. The airlines are very careful not to fly, unless the conditions are perfect. For this reason, we recommend you always allow a minimum of 2 cushion days at the end of your trek, before returning to your home country to ensure you do not miss your return flight. We are sure that you will find this flight to be an exciting and exhilarating experience!